After 17 years away, the all-conquering Toyota team is back in the FIA World Rally Championship with the 2017 Yaris WRC. 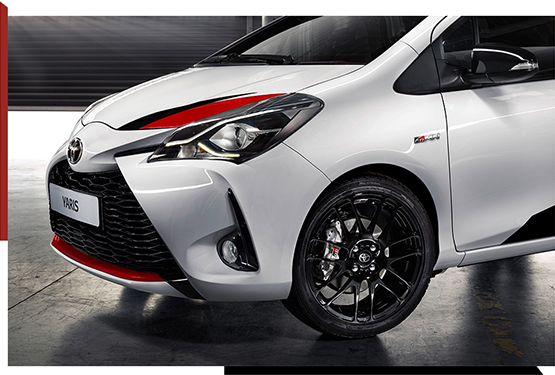 This has inspired the new limited-edition Yaris GRMN: a full-blooded hot hatch tuned and tested on the Nürburgring’s Nordschleife. Reinforced chassis with additional bracing, including an extra bar between the front suspension towers for a genuinely rewarding drive. Sport steering wheel and a redesigned combimeter form part of the driver-focused interior. BBS 17-inch multi-spoke alloys complete the sports look. Front sports seats made with Ultrasuede ® (registered trademark of Toray Industries) and specially designed by Boshoku for best in class body holding and support. Black wing-type rear spoiler, rear diffuser and centre exhaust tall pipe showcase its performance credentials. Supercharged 1.8-litre engine, Torsen limited-slip differential and larger front stabiliser provide a unique hot hatch experience. Turning a high-performance rally-racer into a thoroughbred road-car takes a group of people with unwavering passion. 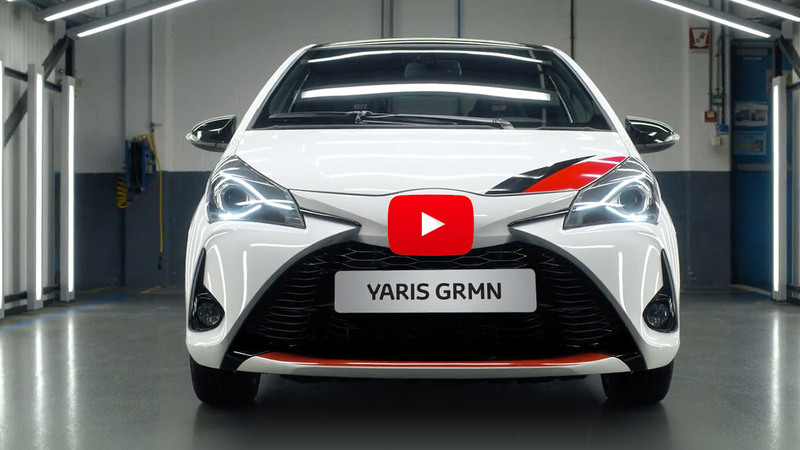 Told from a unique perspective, we follow the journey of the first Yaris GRMN through our factory, from forging its race-bred body right through to the test track where it earns its colours. Four kilometres from the legendary Nürburgring Nordschleife is a small garage. Here specialist Toyota engineers and drivers from around the world are hard at work fine-tuning the performance and handling of the Yaris GRMN to ensure it’s a winner! Inside our Nürburgring garage, teams of engineers painstakingly labour over every detail of the Yaris GRMN. Incorporating the same facelifted body shell as its Yaris WRC brother, they test and retest parts to ensure the Yaris GRMN performs even better than before! The Yaris GRMN’s powerful 1.8-litre supercharged engine helps it reach speeds of 230kph, but that’s nothing without the precise control of suspension, brakes and steering. To achieve their performance targets, Yaris GRMN’s engineers live by the mantra: test, learn, improve! Thanks to an exciting blend of power and precision that's born from world rally, the Yaris GRMN delivers a performance that makes you feel as one on the road. While WRC fans excitedly lined the stages of the 2017 ADAC Rally Deutschland, two-time Ladies World Rally Champion, Isolde Holderied, treated unsuspecting TOYOTA GAZOO Racing fans to a test drive they’ll never forget! Sorry, all Yaris GRMN units are now reserved. We recommend registering your details, so we can contact you should one become newly available. TOYOTA GAZOO Racing Stay up to date with all Toyota's motorsport news at the home of TOYOTA GAZOO Racing. Yaris There’s a contagious spirit about the new Yaris. Its bold colour range, energetic lines and stylish features don’t just ensure a stress-free and comfortable driving experience, its natural flair can turn an ordinary trip into a journey packed with energy and vigour. Toyota at Paris Motor Show 2018 As the automotive industry enters a once-in-a-century transformation, Toyota has started a shift from being a pure car company towards becoming an overall mobility company – offering ever better mobility for all The sky’s the limit: Toyota in the WRC After a successful debut in 2017, TOYOTA GAZOO Racing head into the 2018 FIA World Rally Championship with more knowledge, an improved car and a dynamic driver line-up, ready to push the limits for better. In search of the #YarisEffect To mark the launch of the 2017 Toyota Yaris, we called in a team of European Instagram-mers to capture the new car against the backdrop of the city of Leiden and its surroundings in the Netherlands. Toyota at the Geneva Motor Show 2017 | Toyota Europe From a first glimpse of the dynamic new 2017 Yaris, the hot Yaris GRMN, the radical urban i-TRIL Concept to the latest TOYOTA GAZOO Racing machinery – the Geneva International Motor Show is the place every Toyota fan should be. Victory for Toyota Yaris WRC at Rally Sweden For the first time since 1999, Toyota has won a round of the World Rally Championship, a feat achieved on only the second event for the all-new Yaris WRC. Recall As part of Toyota’s commitment to quality and safety, Toyota is expanding these recalls involving certain Takata airbag inflators in Toyota. At Toyota, the safety of our customers is our number one priority, which is why we continually monitor the performance of our vehicles through a number of sources. If we become aware of a certain component or aspect of our vehicles that doesn’t meet our strict standards we will take appropriate action, as we have done in this instance.